This photo has to go back to the early 90's. It just kind of turned up when we were doing some cleaning. 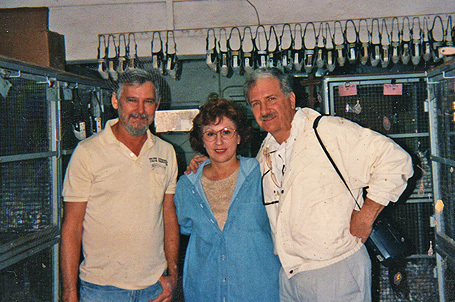 The photo depicts Jim Fritz, Gay Latimer and myself at the Fritz Kennels in Hollywood, Florida. Those were the days when we picked up the greyhounds ourselves and drove them back to Philadelphia, whether it be in a dog trailer, on a truck or even flying with us by air. Fritz Kennels is an example of what a nice kennel should look like. As you can see, it had crates similar to those that we used at Wingate Street. You can't see from the photograph, but they used shredded paper for bedding. Muzzles are all neatly organized and hung in the back. Haven't we all aged well? !